Written on June 30, 2014 . Posted in Announcements + Updates, Fine Arts. 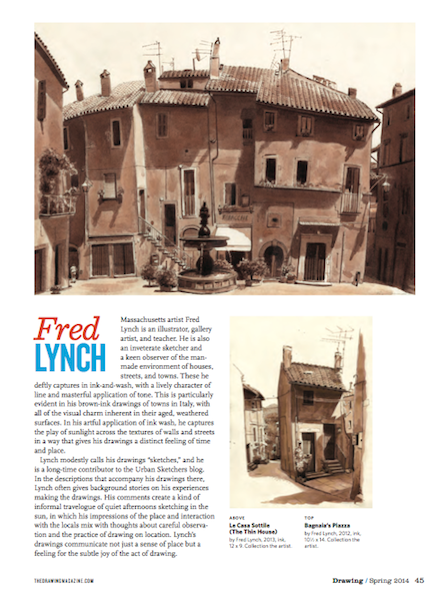 Fred Lynch (Senior Critic, Illustration Department) is featured in the Spring Issue of Drawing magazine. The article features six artists from around the globe who are known for their mastery of drawing in ink. The Spring 2014 issue of Drawing focuses on ink and the many ways artists use it in their work. Articles include a survey of artists who work with the medium and a rundown of the different types of inks available.